FasTracKids International plays an important role in the world’s need for educational solutions that create better prepared children – for school and for life. FasTracKids is an acknowledged leader in providing results to address the globally recognized need for innovation, creativity, language and analytic skills in our future generations. Focusing on the FasTrack Five Advantages – critical thinking, creativity, communication, collaboration and confidence – FasTracKids programs help children bring these skills to their educational and life settings through an interactive, compelling and captivating environment. By developing better-prepared, more effective learners, FasTracKids has a direct impact on the children who pass through its doors and in their communities around the globe. 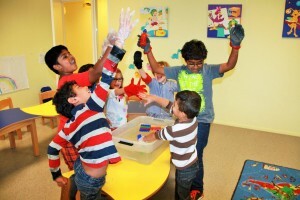 FasTracKids early-learning programs reach a wide age range of children, from as young as 6 months up to 8 years. The early learning programs are designed to support and enhance a child’s development in cognitive, emotional and social skills. Through the combination of multi-sensory learning methods and interactive technology, FasTracKids provides an educational advantage for the 21st century while making learning fun! FasTrack® Signing – Do you ever wonder what your baby is thinking? As parents of infants, we know our children can communicate before they can speak. Our FasTrack Signing program will help you understand what your child is trying to tell you, without the frustration. FasTrack® Music – Did you know that music is a springboard for your child’s success in core subjects such as math, science and literacy? FasTrack Music supports your child’s learning, moving and growing in a creative and fun way. FasTrack® Tots – As your child toddlers, wiggles and laughs, he is investigating his world. Two year olds are exploring and testing out their world, using all their senses and making their own conclusions. Our FasTrack Tots class helps meet the need of your toddler by providing a first step to independent learning and collaborative friendships. FasTrack® Explorers – The preschool experience sets the stage for your child’s attitude towards school. The best first school experience for your child is through FasTrack Explorers. Our proven method of delivering a firm foundation for learning is available as a multi-day preschool program. FasTrack® Discoverers – Your young learner has a natural curiosity for investigating, experimenting and discovering. Our FasTrack Discoverers program for 3 – 5 year olds provides an engaging, multi-day preschool educational setting to nurture your preschooler’s inquisitiveness and prepare them for success. FasTrack® Music – The advanced FasTrack Music program for 3 – 5 year olds is focused on preparing children for formal music lessons while still having a fun, positive experience. Children are introduced to composers, songs and musical styles such as classical and jazz while learning music theory, instruments and music vocabulary. Children also learn basic keyboarding techniques. These lessons provide a solid foundation for music education and lifelong appreciation of music and movement. FasTrack® Fundamentals – The FasTrack Fundamentals program is a fun, interactive way to give your child the necessary skills to succeed in the 21st century. Utilizing the interactive whiteboard and our methodology focusing on developing the whole child, FasTrack Fundamentals provides a balanced learning approach for 3 – 8 year olds. FasTrack® English – FasTrack English introduces and supports children’s English development, which improves the way they think and interact with the world around them. The optimal time for anyone to fluently learn another language is before age 8. FasTrack® Camps – FasTracKids offers your child a fun, energetic day camp experience that will help them avoid the holiday education backslide. Recent studies have shown that students who “take a break” from learning can lose up to six months of education! This learning loss puts them at a significant disadvantage when they re-start school.